The try...catch statement marks a block of statements to try and a block of statement to catch errors if an exception is thrown. The try block contains one or more statements enclosed by brackets. The catch block also contains one or more statements enclosed by brackets that specify what to do if an exception is thrown in the try block. If any statement within the try block throws an exception, control immediately shifts to the catch block. If no exception is thrown in the try block, the catch block is skipped. 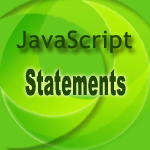 The above example contains a script which should write a statement "We are learning Try..Catch statement in a web page. But the code produces an error as document.write() is mistyped documentt.write(). Let's try the above example with a Try...Catch statement. The above code produces an error as alert() is mistyped alertt(). However this time the code will hide the error as catch block catches the error and display an user friendly message.